What does it mean to be a Christian? A Mormon apostle explains. “A Christian has faith in the Lord Jesus Christ, that He is the literal Son of God, sent by His Father to suffer for our sins in the supreme act of love we know as the Atonement. “A Christian believes that through the grace of God the Father and His Son, Jesus Christ, we can repent, forgive others, keep the commandments, and inherit eternal life. “The word Christian denotes taking upon us the name of Christ. We do this by being baptized and receiving the gift of the Holy Ghost by the laying on of hands by those holding His priesthood authority. “A Christian knows that throughout the ages, God’s prophets have always testified of Jesus Christ. This same Jesus, accompanied by Heavenly Father, appeared to the Prophet Joseph Smith in the year 1820 and restored the gospel and the organization of His original Church. “Through the scriptures and the witness of Joseph Smith, we know that God, our Heavenly Father, has a glorified and perfected body of flesh and bone. Jesus Christ is His Only Begotten Son in the flesh. The Holy Ghost is a personage of spirit whose work is to testify of the Father and the Son. The Godhead is three separate and distinct beings, unified in purpose. Mormonism recognizes three Gods in the Godhead while orthodox Christianity has always been committed to the doctrine of only One True God (in Trinity). Therefore, on the face of it, according to Mr. Hales definition only Mormons are Christians. Anyone who believes in the orthodox doctrine of the Trinity, or chooses baptism in a different church, or dismisses Joseph Smith’s First Vision (etc.) is not a Christian. A Christian believes that through the grace of God … we can repent, forgive others, keep the commandments, and inherit eternal life. The word Christian denotes taking upon us the name of Christ. 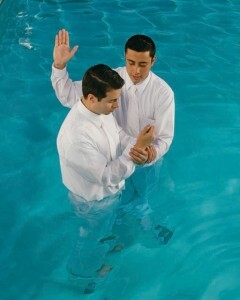 We do this by being baptized and receiving the gift of the Holy Ghost. This edited list has lost every Mormon distinctive that is found in Mr. Hales’ original: No mention of Jesus being the “literal” Son of God; no mention of priesthood authority; no mention of Joseph Smith’s First Vision; no mention of a Father God of flesh and bone; no mention of Jesus being the only begotten “in the flesh”; no mention of the Godhead being comprised of three Gods. The Mormon Church seems happy to recognize non-Mormons as Christian per the broader, more inclusive definition found online and in the March Ensign; but to be a Christian Christian – well, that appears to be another story altogether. 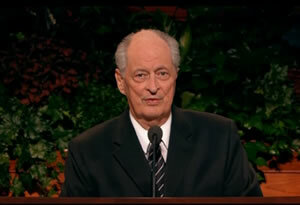 This entry was posted in General Conference and tagged Authority, Christian, First Vision, Jesus Christ, Mormon, Nature of God, Priesthood, Robert D. Hales. Bookmark the permalink. 106 Responses to What does it mean to be a Christian? A Mormon apostle explains. I have never heard of supposed anachronisms in the Bible that can’t be accounted for upon more careful examination. I was just allowing for the possibility for some to be there, which would neither surprise me nor bother me because, to my satisfaction, the Bible is very, very reliable as an ancient document. Tom, thanks for sharing about your journey from Mormonism ; from Joseph to Jesus . ex-LDS for Jesus . Thanks again for your contribution here . into , especially if they’ve already listened to the sales pitch from Mormon Missionaries . these apostles can be found in the New Testament. I’m the one who writes often about Mormon “spiritual” experiences. At one time we had a former Mormon post here by the name of fmelo. He also had been tuned into spiritual experiences as a Mormon and even that wasn’t enough to hold him in the pack. I had long discussions via e mail with him because the spiritual experience angle is one that interests me and that I’ve studied for a long time. I’m convinced that a lot of spiritual experiences come right out of the soul of man. In-other-words they don’t come from the Holy Spirit. I’m what someone would label a full gospel Christian. So I’m tuned into supernatural occurrences and also the determination of their source. Very interesting that you chose the Bible over your spiritual experiences which you thought at the time were a confirmation of Mormonism. People go way off the track when they start trusting in their experiences rather than the testimony of God’s Word. We really have had an impressive line-up of former Mormons here lately and I’m rejoicing in that. Please stick around. I know after a point, former Mormons just want to be done with it and get on with their lives. I hope you will favor us with accounts of your past and your present progress. Oh wonderful, I understand now. God bless. Thanks for sharing. I’m a little late to the party, but I wanted to chime in and say praise God you’re on your way out! My husband is going through the same process you are (he has yet to figure out how to tell his family). He just can’t get over how much information was kept from him. Obviously God is really moving… it seems like I just keep hearing more and more stories of Mormons finding their way out. Anyway, just wanted to say congrats and welcome to your new life in Christ! I’ll be praying for you guys. FoF, you just did it to me again. I certainly don’t expect you to hit every single point brought to your attention, points made by me or anyone else. The larger point of my last post was to suggest that you only respond to that which is most comfortable. There could be several reasons for that, but I wonder if you see the same things we do. What we bring up, we bring up for a purpose. What we bring up is important, and if we keep talking about it, it may be useful for you to address them. But you don’t. As I stated, when you are receiving comments from several different people, you can’t be expected to address every single point. But like you did to me now, quite often when you do address something, you miss the point completely.